When the biggest irony is that I loved loved loved it. 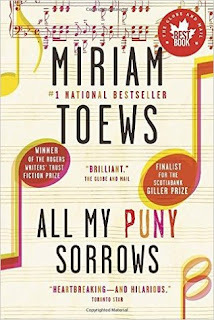 About All My Puny Sorrows by Miriam Toews*: You won’t forget Elf and Yoli, two smart and loving sisters. 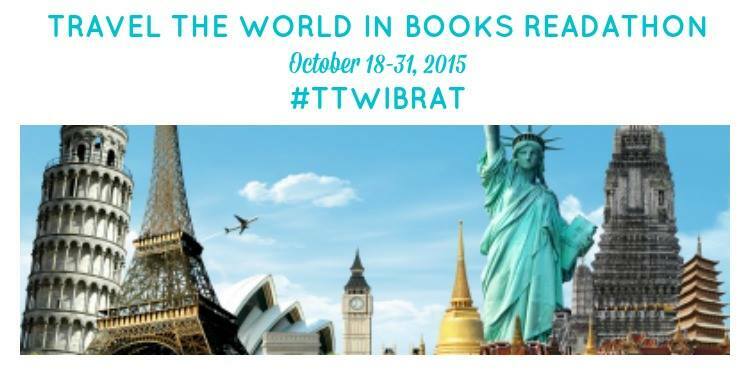 Elfrieda, a world-renowned pianist, glamorous, wealthy, happily married: she wants to die. Yolandi, divorced, broke, sleeping with the wrong men as she tries to find true love: she desperately wants to keep her older sister alive. Yoli is a beguiling mess, wickedly funny even as she stumbles through life struggling to keep her teenage kids and mother happy, her exes from hating her, her sister from killing herself and her own heart from breaking. Upon putting this down, I sighed and felt my heart was full. This is what real, raw, honest writing is ... and wow, what that does to a reader. This moved me deeply. Very few authors can pull off what this book has accomplished: it is funny yet compassionate, sensitive and sweet yet uncloying. 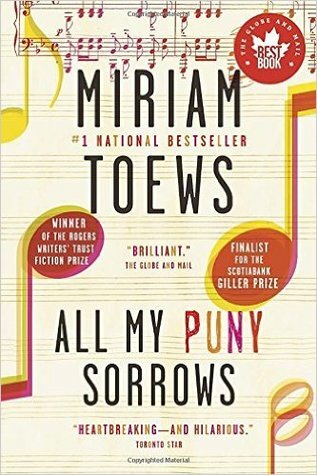 When I see an obviously ironic cover, I can't help but duck sometimes - but yes, suspend judgment I did, because I loved Toews's A Complicated Kindness. And lo and behold, I didn't even roll my eyes even once or inwardly groan or cringe. And that's saying a lot about a book that delves deep into the complicated stuff of sisterhood, depression, pain, suffering, assisted death, and suicide. Toews is unafraid to articulate all those messy bits and then some. She lays it out bare, never mind being political correct. She takes no heed for taboos. And the humor! Her humour comes with a really honest emotion that made me unafraid to continue reading. Especially charming about this book are the banter and dialogues which are very realistic and oh-so-relatable. In my mind's eye, I relived some of my own little arguments and conversations with family members. I loved getting immersed and invested -- mentally and emotionally - in Elf and Yoli's lives and the complicated relationship that rules most siblings. I couldn't believe it when the book rolled to its close. I wanted more. This book takes place in Canada, more or less equally between Winnipeg and Toronto. I am familiar with both cities so it was lovely to see mentions of specific places including restaurants and landmarks and get a real sense of the place. Locals of these cities can't help but see these subtle little nods to beloved haunts. There also little nods to literature and classical music. Throughout, there are mentions of much-loved books. I love classical music so the fact that Elf is a famous and tortured artist appealed to me - it lent a little more humanity and the suffering behind creating beauty. This is a gem of a novel in my eyes. I think anyone who loves and honest book will get sucked int this one. Highly recommended. P.S. If you pronounce the author's last name as "toes" then you're not the only one! I'd been doing it for ages until I got heard someone say it otherwise (to my dismay and embarrassment). Here's how to pronounce Toews - properly! 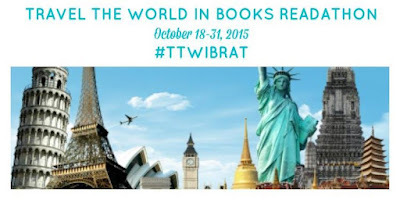 This is a book that qualifies for the Travel the World in Books Challenge. The story is set in Canada and the author is Canadian. Toews is well-known for her novel A Complicated Kindness.